Goa is a place where even life takes it easy. 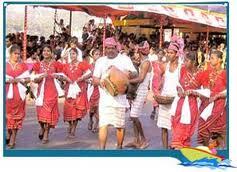 The laidback attitude and easy going lifestyle is mainly due to the easily adaptable Goan traditions and customs. Since the place has been ruled by different empires time to time, the customs and traditions have been molded according to their beliefs and thought patterns. This has led to the flexibility of the traditions and customs of Goa. Though laws prevailing in the state are stringent, people go easy on traditional practices. The tradition of Goa is quite rich and possesses a unique legacy of different cultures. In Goa, tradition and customs have affected almost every aspect of the Goan lifestyle. One can see the typical Portugal custom of constructing a house. Churches are built in the traditional Portugal style. People are free to practice the religion of their choice and they respect the existence of other religions too. At the same time, they move ahead with the world and are in sync with the latest trends and beliefs. The traditions and customs of Goa have allowed secularism to flourish and have made people more tolerant towards other religious practices. It is not uncommon to see people from another religion going to a church or a temple or a mosque. They follow the tradition of their choice and at the same time respect other customs. This is what makes the Goans stand out in a striking contrast to the rest of India. The Goan tradition and customs have truly given a unique identity to the state and made it a role model for others.